I bought this ASICS racing shoes as my “prize” for finishing the 2009 Los Angeles Marathon in May of same year. I think I bought it through On Line/Internet with a cheaper price as it was not available in the running specialty stores in Los Angeles. I did not try to use it for my daily training or made a “break-in” of this racing flat shoes and had to use it immediately in a Marathon Race. What caught my attention and interest in buying this racing flat was for the reason to have a lightweight racing flat for my road races aside from the fact that I am an ASICS “die-hard and loyalist”. The shoes was advertised to have a weight of 6.9 ounces! The running shoes that I used in the 2009 Los Angeles Marathon was my one-year old ASICS Gel-DS-Trainer which I have retired after the said marathon. As compared with the DS-Trainer, the Hyper Speed 3 is much, much lighter. It was advertised also as the official racing flats used by US Marathon Runners Ryan Hall and Deena Castor in the 2008 Beijing Olympics. Although these runners did not win any medals in the Olympic Marathon Race, the shoes was still popular because of its lightweight but well-cushioned sole due to the presence of gel inserts which “disperse shock on foot impact on the ground and during toe-off”. It also has “Magic Sole” which minimizes weight and maximizes breathability because of the presence of well-placed “holes” on the sole. Even the open mesh upper is made of lightweight material which provides comfort to the feet and additional breathability. The first time that I used this shoes was during the 2009 MILO Marathon Elimination which was held last July 5, 2009. I did a poor performance on this race due to lack of training and preparation after the 2009 Los Angeles Marathon. The shoes was really light and versatile for marathon races as I did not have any problems or pains after the marathon race. The shoe appears to have a narrow width but as soon as I wear them, I can still feel more room for my feet. But in order to prevent my upper midfoot from sliding from side to side, I have to tighten the narrow & thin shoestrings for me to feel a “tight & well-snugged” fit with my feet and the shoes. Since then, I’ve been using this lightweight racing flat in my next marathon races except when I participated in the 2009 Pasig River Marathon in November where I used an Adidas Adizero Racing Flat. I think this sudden change in racing shoes had also contributed to my peroneus injury at the middle of the said marathon race. In my other marathon races, this shoes helped me a lot to register better finish times in the 2009 MILO Marathon Finals and the 2nd SMART Subic International Marathon. Lately, I used this shoes in my latest Condura Marathon held last February of this year. So far, I used this racing flats in only four (4) marathon races which is contrary to some of the reviews that I’ve read that say that this racing flat is more recommended to be used up to half-marathon distance races. But with my experience, this racing flat is perfect for the marathon distance. However, this kind of shoes should not be used in trail running as small rocks and dirt might enter through the “holes” of its “Magic Sole”. Since I only use this shoes in my Marathon Races, I think I have yet to breach the 200-Km usage of this racing flat. 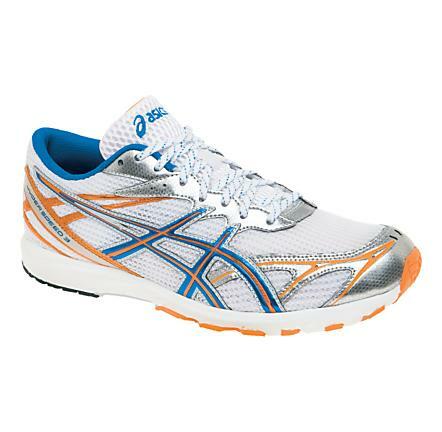 After browsing the Website of ASICS, I’ve seen the new model of this shoes, which is the Hyper Speed 4. I guess, I have to wait for my Hyper Speed 3 to reach the 600-700-Km mileage before I will be able to replace it with the latest model. I don’t recommend this racing flats to those who are using cushioned/stability shoes as these are neutral shoes. I don’t also recommend this shoes to those heavyweight runners, moreso, with the “newbies” and those who have not yet experienced their first full marathon. This racing flats need strong feet and strong legs for them to provide the runner’s a decent finish time in any road race. Thank you for the review on the ASICS Gel – Hyper Speed 3. All 3 pair of my running shoes are ASICS, and I do not plan to switch in the immediate future. Most of my miles (training) are done with the Kayano 15s. Have not stepped up to racing flats. Thanks for the tips. I have been a proponent of minimalism especially in shoes and am glad I transitioned from clunky shoes to racing flats. My feet, calves and legs are now stronger. Runners, should, however transition gradually. Key word is “gradual”. I remember wearing over-padded shoes, then trainer, racing flats and then barefooting occassionally. Took me about 6 months. I love Asics. One of the sturdiest running shoes out there. Too bad, hard to find in our country.